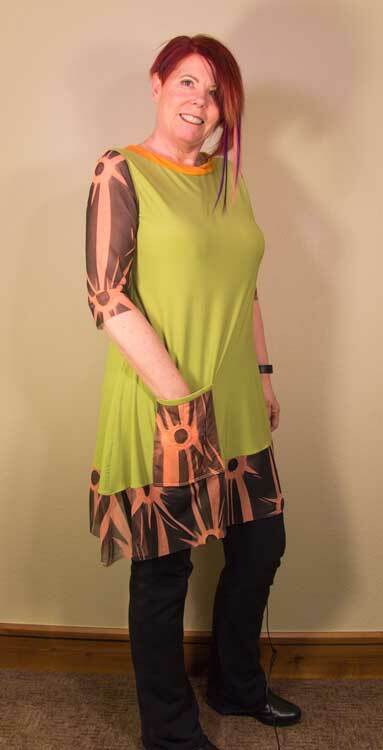 I made another tunic top from my favorite pattern Vogue 8952. This top is for summer so I used a sheer mesh knit for the sleeves and the ruffle on the bottom. I fused the mesh to a piece of solid knit to make the pocket. I may add a bit of stenciling later. Both the fabrics came from a store in Dallas that we passed by while visiting my delightful mother-in-law. 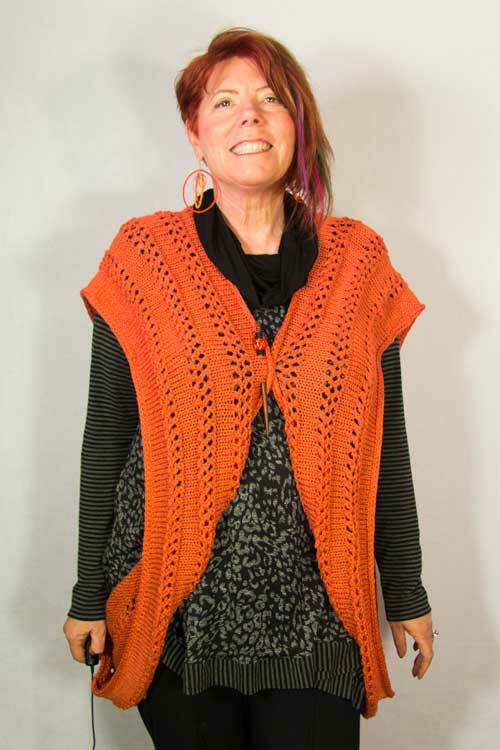 I’m not sure I love the combination, but I also made this vest layer piece out of a knit that has sheer stripes on the solid black. 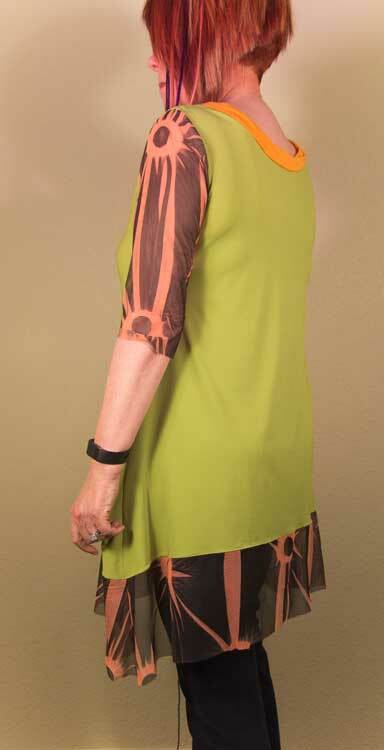 The black is very intense so it seems a bit too opaque on top of this tunic, but I love the lines so I’m sure there will be a match with a few tops in my wardrobe. I reviewed the Jacket for this outfit a few weeks ago. Here is the entire ensemble, which I wore to a charity event last weekend. 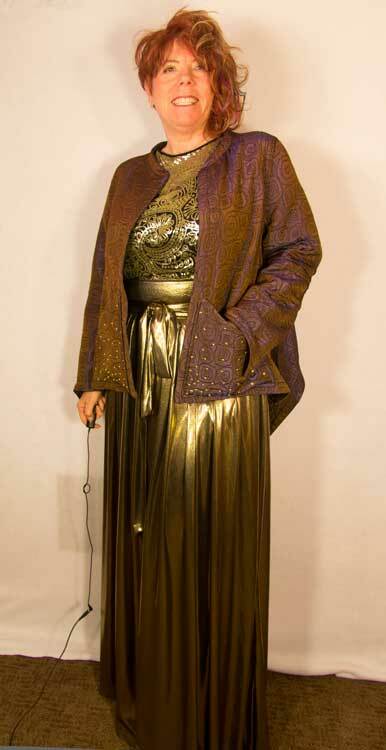 I felt wonderful wearing my head to toe look with lots of metallic! I constructed the palazzo pants with Vogue 8955. They took 4 yards of gold lame fabric that is actually a stable knit, and very light and liquid. The pattern was relatively easy to sew, but the waistband must fit perfectly. Tight enough to hold up so much fabric, but too tight and it would be uncomfortable for a 4-hour event. I couldn’t find a pattern for the top that I envisioned so I drafted my own! It took two muslins to get it right but in the end I was very happy with the lines. The entire outfit was comfortable and glamorous at the same time. I have seen a number of wonderful refashion projects using shirts to make skirts. I owned a few silk charmeuse shirts that I never wear and then found another at a used clothing store. My fabulous mother-in-law gifted me the black one on the right. First I washed and dried the shirts with the cotton setting on my washer. Yes, hot water and a hot drier! Silk is very strong and I wanted this outfit to be washable for everyday wear. The first photo is of the shirts after washing. Hardly any wrinkles, and if they did shrink then better now than after sewing. I started by cutting off all of the elements and sorting. 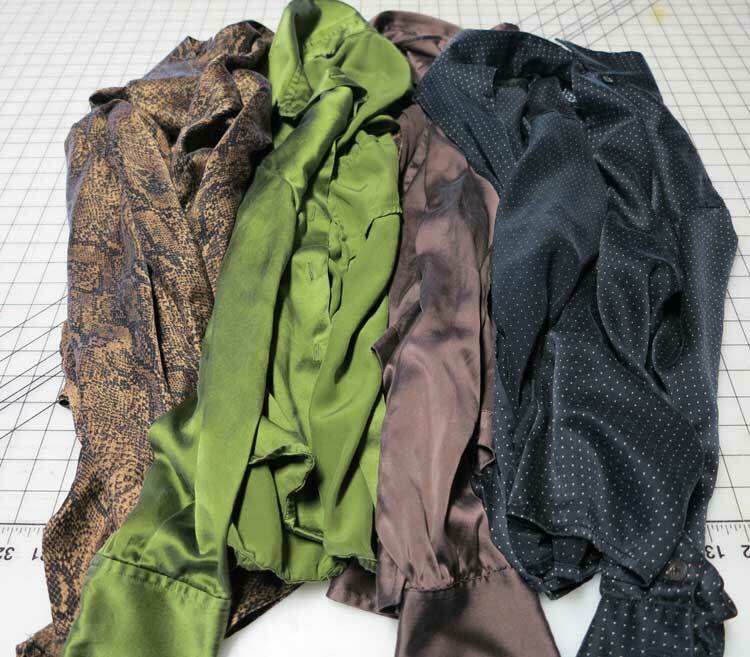 The collars in one area, sleeves, cuffs, and the main body parts are each placed in their own pile. The leopard shirt caught my eye and I decided to save the body of that shirt to make into a sleeveless shirt/vest. 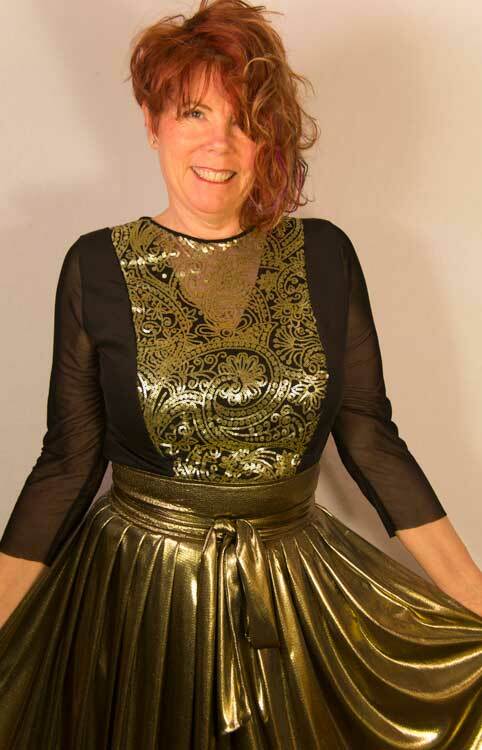 This photo shows the shirts placed to form bottom of the skirt. It’s fun to include some of the plackets with buttons. 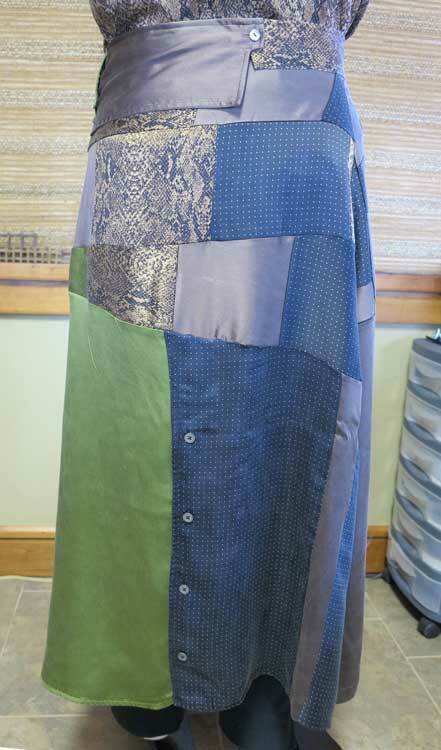 I decided to use the Taos Skirt pattern from Diane Ericson. It has a simple front and back and multiple ways to make the waistband so I could postpone that decision until later. In the end I decided (with the help of my BSF Debra) to make the waist out of the cuffs from the shirts. The shirt was simple with binding from one of the shirts and a doubled collar from another shirt. I think it will feel great when the warm weather finally hits! Most of my knitting is during movies, but once in a while we take a road trip. My husband and I listen to an audio book, he drives and I just knit away. For shorter trips we find this much more enjoyable than fighting our way through the airport. This time we drove to Texas to visit family. 2 days of driving each way is a lot of knitting! 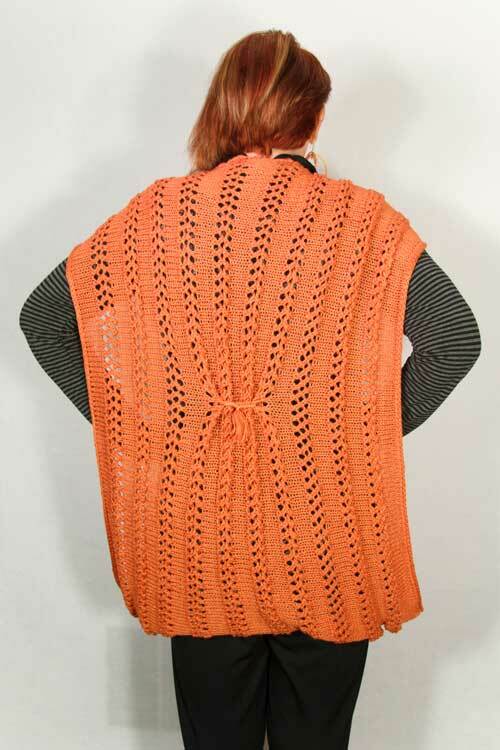 The Makalio Vest (Ravelry.com) just caught my eye as a fun layer for summer. I couldn’t resist the oddness of this loopy vest. It’s a fun extra layer instead of a scarf when an outfit needs a little something extra. 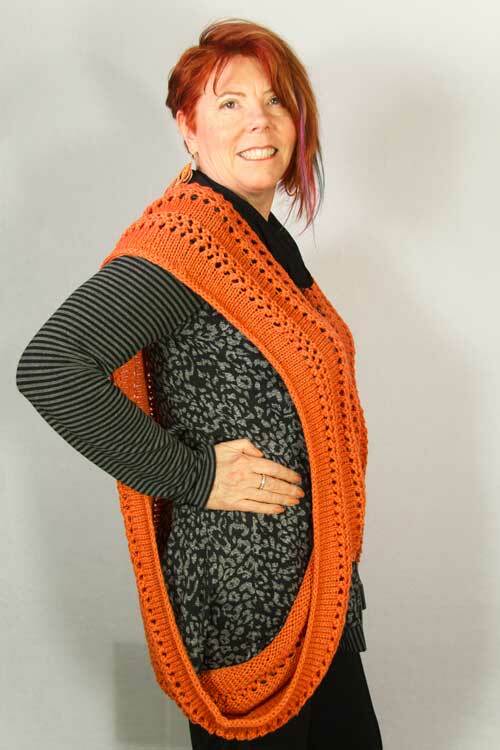 The designer of this pattern shows how to wear it in other ways, so some experimenting will be in order. Here is a view of the back with the optional tie. She also shows it with a belt around the back with the loops free-flowing on the front. All in all…kinda cool!